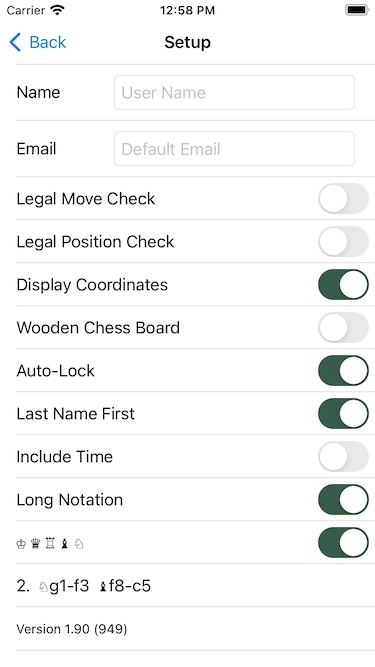 Chess Score Pad follows Apple's Adaptive User Interfaces guidelines to supporting any size display or orientation of a device. This includes "Auto Layout" to adapt to different size devices and orientations. When running on an iPad, the move recording screen is always visible. In landscape mode, the other screens (list of games, game details) are on the left side. In portrait mode you need to "right swipe" at the top of the screen to display the navigation views. Chess Score Pad supports Dynamic Type. You can set your preferred text size in your Settings, Display and Brightness, Text Size. This is the screen that is displayed when you first open the app. Tap Games to see the list of games. Tap Setup to enter application setup and preferences. Tap Web Site to exit to the Chess Score Pad web site. If you do not see this screen on an iPad, rotate to the landscape mode. Before using Chess Score Pad you should enter your name and email. 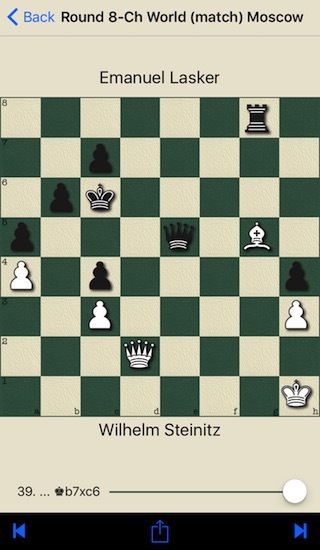 Then your name can be automatically entered and the app will know to put your pieces at the bottom of the board. Entering your email here will save you from entering it every time you email a game. Name: This will be used to automatically enter your name after you enter your opponent's name for a game. It will also be used to determine which color to put at the bottom of the screen. Email: This will be used when you email games. Display Coordinates: Turn ON to display algebraic coordinates over the board. You can also double tap the board with two fingers to toggle this setting while entering or reviewing moves. Auto-Lock: Turn OFF to prevent your system Auto-Lock setting from turning off the screen during a game. This only applies to a game with no result entered. If your battery level is low, you can turn this on to have the system automatically turn off and lock your display. Last Name First: Turn on to have names from your contacts entered Last Name, First Name. This is a PGN standard. This should match how you entered your name. This only applies if you have entered the names of players you play frequently in your Contacts application. Include Time: Turn on to include the time between each move displayed on the notation of the scoresheet. This time is when the moves were recorded, which is not always the time that they were actually made. This option will also add a "%emt" comment to the PGN files so other applications can display the time. Long Notation: Turn on to use long algebraic notation (♘g1-e2) for the scoresheets and move display. Turn off to use standard algebraic notation (♘ge2). 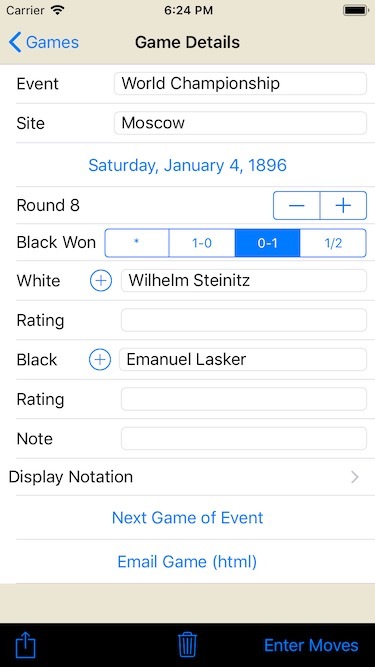 ♔ ♛ ♖ ♝ ♘: Turn on to use figurines (♘f3) for the scoresheets and move display. Turn off to use standard algebraic notation (Nf3). 2. Nf3 Bc5: This is an example of the notation based on the current selections. Tap any row to display the game details. Tap + to create a new game and display the game details screen. You can delete games from the list by doing a "left swipe" gesture on a row to present a "Delete" button. Then tap the button to confirm. Tapping the share action button ( ) at the bottom will allow you to share all of the games in the list in a single file. The options will depend on your device but normally include AirDrop, Message, Mail, Add to Notes, Copy to Notes, Copy to Clipboard and Save to File (iCloud if your account is set up). The search bar can be used to filter the list to show game of a particular event. Enter the name of the event in the search bar to only show games of one event. When I play my weekly Quads Tournament, I include the YYMMDD in the event name so each tournament will have a unique name. The file will be named using "Event" and the text in the search. The Game Details screen is where you enter the information that is typically at the top of a scoresheet. Site: The site of the event. The date defaults to the date you create the game. Tap the date to change it. Tap the applicable results button to set the result of the game. The results label will update. The round defaults to 1. Tap the - + buttons to edit. For the player names, enter you opponent name first and your name (from Setup) will automatically be entered. Tap to pick names from your contacts. 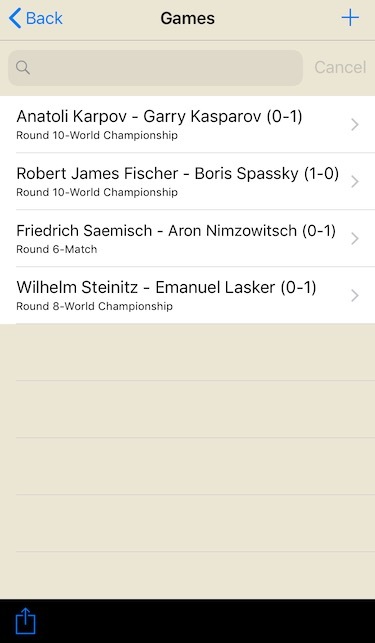 If you play in a lot of local tournaments, you can enter the names of your top opponents in a "Chess Players" group to make it easy to enter names. Note: Any additional information you wish to record for the game. For example, the board number, time control. This text will be included in the scoresheet or email notation, but not the PGN. Display Notation: Display the algebraic notation text. When using an iPad in landscape, this will update with each move. Next Game of Event: This is a handy shortcut to create a new game after the first game of a event. The name of the current event is copied to a new event and the round is incremented. Then all you have to do is enter your opponent's name. Email Game: This will compose an email message with the game details and the algebraic notation of the moves as text or HTML. The HTML email will include the current position you have selected for the game. There is also an attached file of the PGN of the game. Delete (Trash Button): Tap this to display a confirmation that you wish to delete this game. Enter Moves: Tap this to display the screen to enter the moves of the game. This button is not displayed on the iPad since the game is loaded with the game details. Before you record a game, you should put your device in Airplane Mode. This will not only save your batteries but keep you from getting calls during the game. 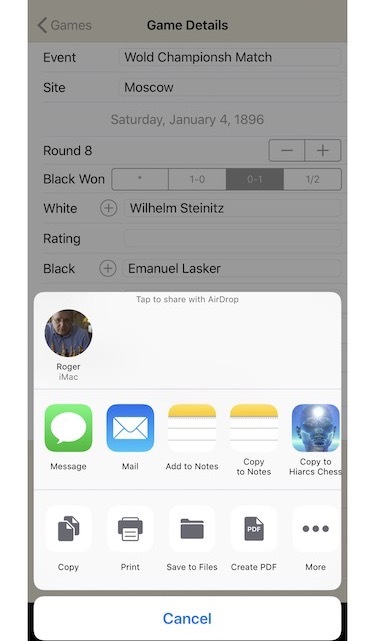 Tapping the share action button ( ) at the bottom of the screen will display the standard iOS sharing. The options available will depend on your device. The Print and Create PDF options will create scoresheets of the game. The other options are for the PGN of the game, either as a file or text of the file. The Create PDF has a markup option that will allow the players to sign the scoresheet when this is required by the tournament director. The signed scoresheet can then be electronically sent to the tournament director. Or it can be printed and signed. This is the screen where you will enter the moves of your game. You can adjust the screen brightness by "swiping" up or down anywhere except on the board. Move Entry: You record your moves by dragging the piece to the new square or taping the piece, then tapping the square. The last move is displayed next to the slider. The slider can be used to quickly display any position in the game to review with your opponent or tournament official. The forward and back arrow buttons will go forward or back one move at a time. You can also use a two finger swipe, left and right. To correct a mistakenly entered move: Tap the back arrow to go to the last correct position. Enter the correct move. You will asked to confirm that you will be deleting the remaining moves. To toggle the coordinates, double tap with two fingers. Tap with both fingers on the board, or both fingers off of the board. To rotate the board use the rotate gesture, with both fingers on the board. To adjust the screen brightness, use a vertical one finger swipe gesture in the space off of the board. These actions are available while you are entering moves by tapping the action button ( ) at the bottom of the screen. Rotate Board. Rotates the board. 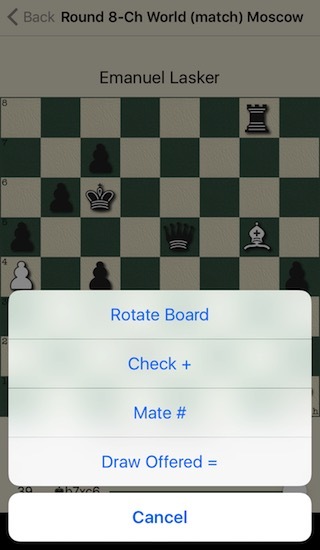 You also use the rotate gesture to rotate the board. Check +: Enter a + to the notation. Mate #: Enter a # to notation and the appropriate result. Draw Offered =: Enter a = to the notation.